Third day of Hack Reactor and we are learning the fundamentals of computer science. First up: stacks and queues! Stacks and queues are basic ordered data structures for storing data with very specific operations. They are defined by two basic operations: inserting an item and removing an item (and by displaying what's in there, I suppose). Inserting data for stacks and queues is the same--you add it to the end. However, it is in the removal where they diverge. For me, stacks are best visualized as a stack of books. If you want one of the blue books, you'll have to remove all the books on top first before you can retrieve it. Last in, first out. .push() inserts a value at the end of an array and .pop() removes the end value of an array. Here we have rewritten push and pop, using a variable 'counter' to keep track of the number of data we currently have in our stack. This also keeps track of the last item we have in our array. This is also quite easy to visualize: it's a line! If you have a line for ice cream, the first person in line gets ice cream first. And that's how we will retrieve information in a queue! 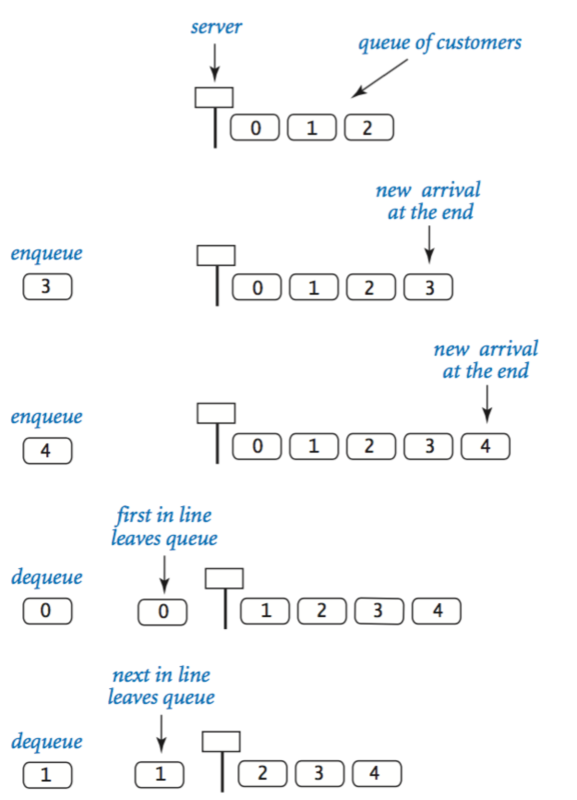 Here's the most basic implementation of a Queue, using the method names enqueue and dequeue for push and shift. As you can see, the biggest difference here is the use of the variable 'nextUp' and the way data is removed. 'nextUp' is used to keep track of what's at the front of the queue.